The annual Dinner Dance and Silent Auction is a fun evening of entertainment designed to benefit The Christina Capozzi Foundation. April 16, 2004 will be the 6th year for the event, with hundreds of people returning each year for the festivities. Every year there are approximately 400 – 500 people who join us in the fun spirited competitive bidding! The evening consists of a sit down meal served family style followed by a silent auction featuring hundreds of valuable items, trips, and various accommodations. Door prizes, raffles, and the famous “Scavenger Hunt” are a few of the highlights of the evening. Dinner is followed by music and dancing provided by a favorite local DJ. The Dinner Dance and Silent Auction is held at the Castleton Function Hall, Windham, NH at 6:30 p.m. For directions, click here. All the proceeds of the Dinner Dance go towards research for Shone’s disease at Children’s Hospital. 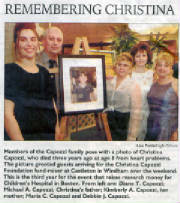 Christina Capozzi Foundation Fundraiser 2003. 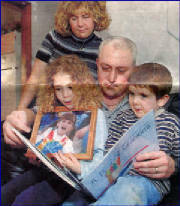 Family's efforts aid heart disease research.